To most, this is going to seem like a silly, purposeless post, and it really kind of is. The only reason I’m taking the time and energy to produce this is because, upon telling a friend of the recent gift I received, she told me she needed a detailed description and pictures of development. The pictures are actually kind of crappy because they were taken at night in my dark-except-for-one-light bedroom with my iPad. It will give you the general idea though. 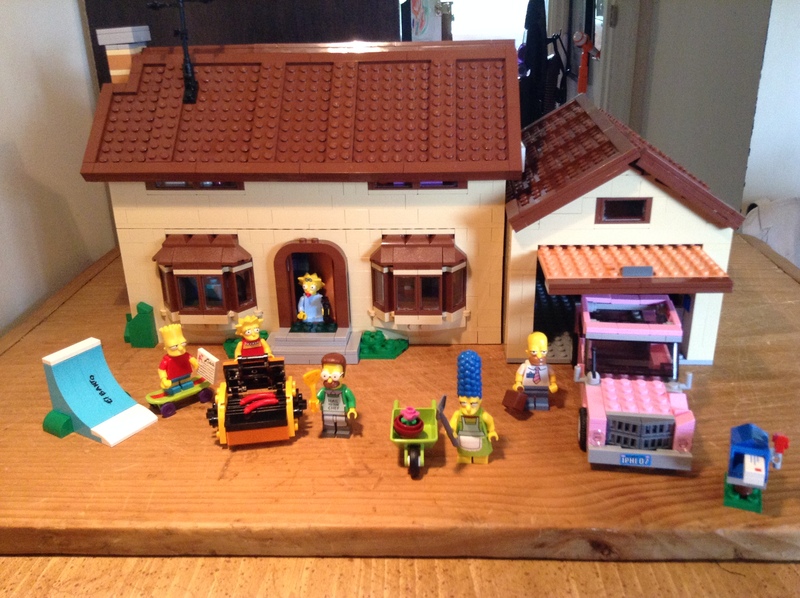 On Sunday I was given the new Lego Simpsons house. I know, I know, what kind of gift is that for a 34 year old mother? Well, I’ll tell you what kind of gift that is: IT’S AN AWESOME ONE! It’s a limited edition set, and if I had any sort of self control and kept it in the box, it would have been worth some serious coin in the future! Thankfully for you, I don’t. 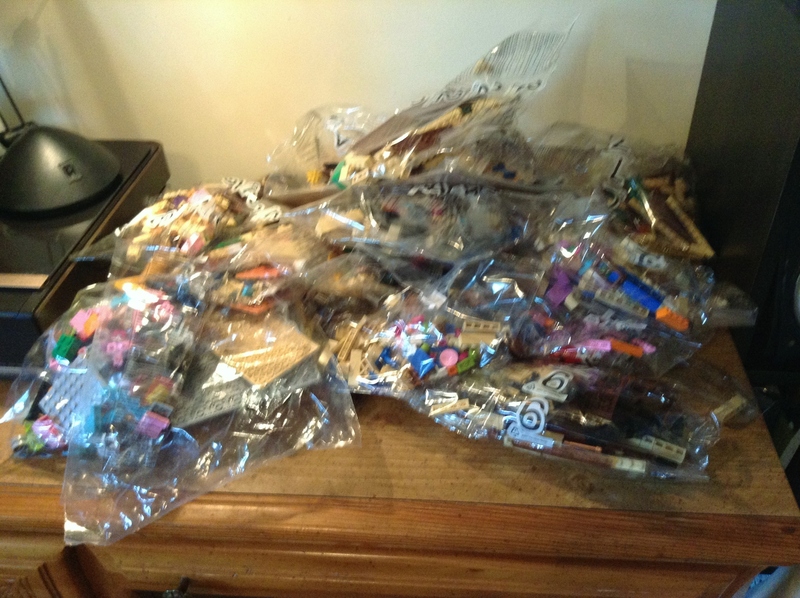 The 2,523 pieces are divided up in numbered bags, which makes it all the more enjoyable, as this set has hundreds of unique tiny pieces, and searching for that one of a kind piece needed for a particular part in this huge set would have been nearly impossible. 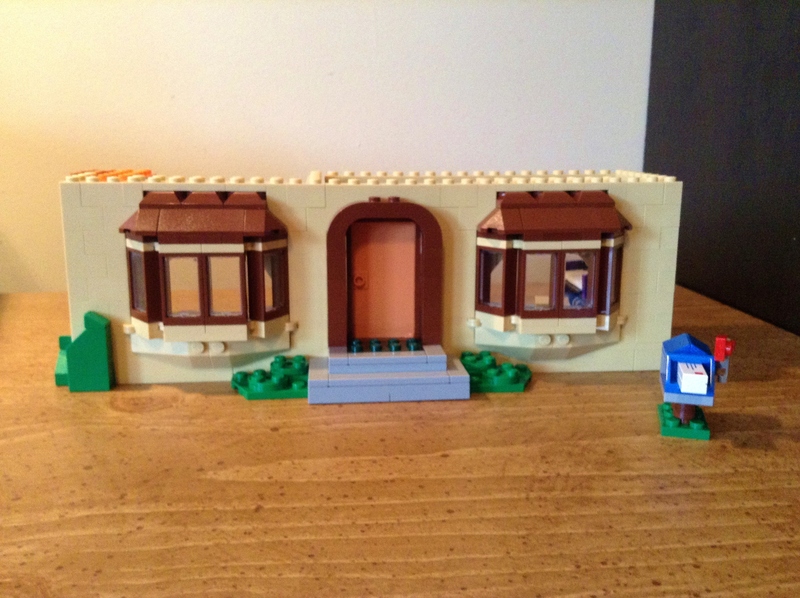 Okay, so not impossible, but for me it would have detracted from my enjoyment of building it! 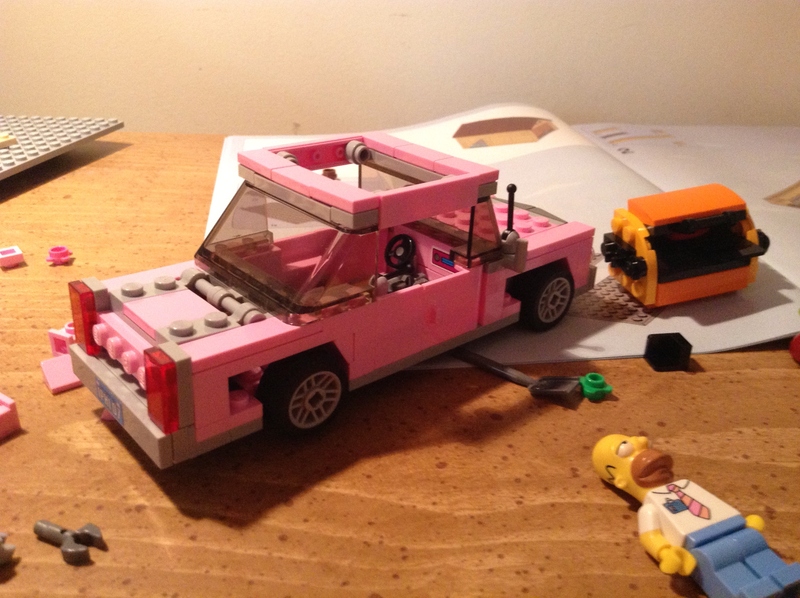 Altogether this took me around six hours to build-maybe a little more. I had a lot of help from my almost six year old son, and while that may have slowed me down a little, it was a tremendously fun family activity! 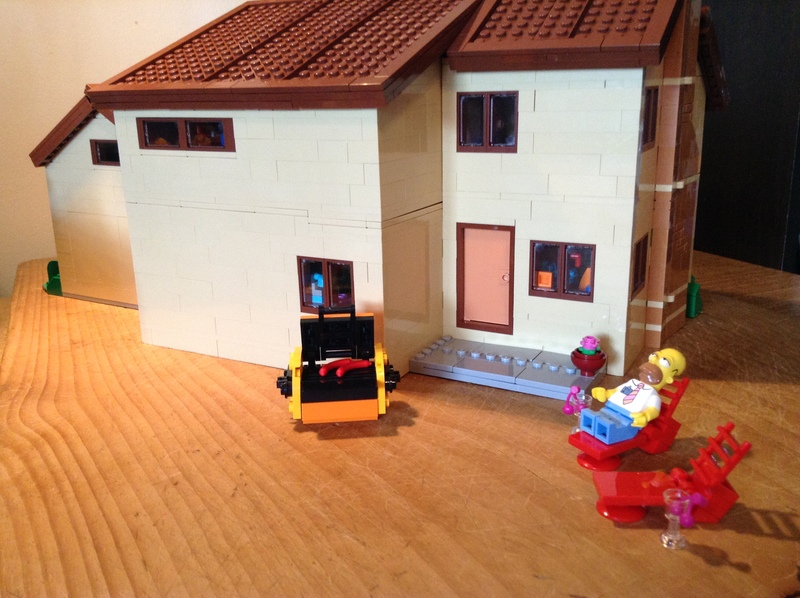 (I don’t allow him to watch this show, so he had no idea who the characters are, so to him they were just a funny-looking family in a cool house. ) The instruction were so long, that they are divided into 3 thick booklets, each one chronicling a section of the house. 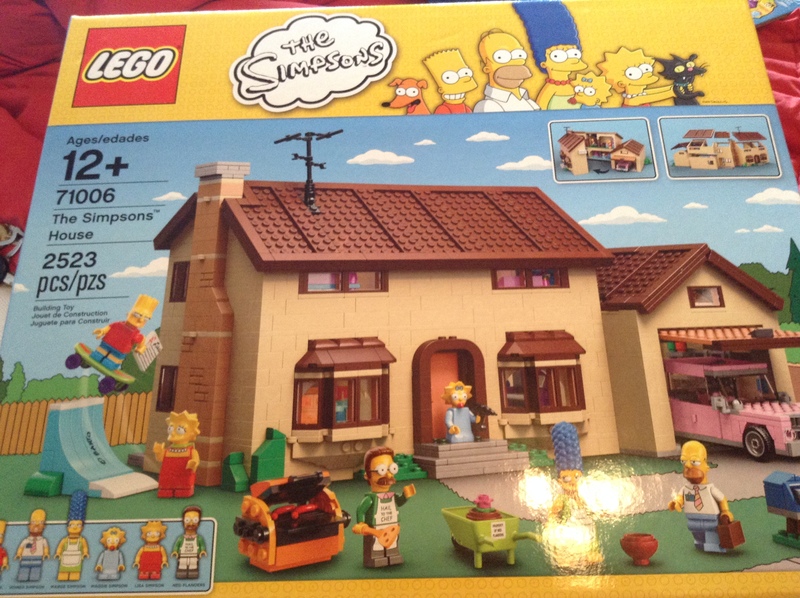 The included characters are: Homer, Marge, Bart, Lisa, Maggie, and Ned Flanders. I believe other characters are going to be produced at some point, which of course I will have to own. HAVE. TO. 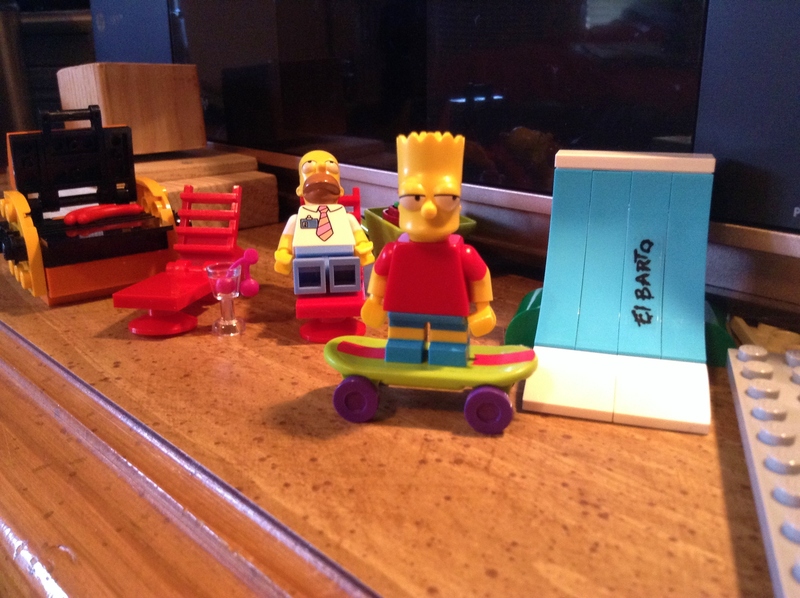 The first things we built were Bart, Homer, the grill, lounge chairs, and Bart’s skateboard ramp. Rowan happily amused himself with those long enough for me to put together the Simpson family car. Bart’s skateboard ramp, complete with “El Barto” graffiti. The Simpson’s car was a fun one to build, and it stays true to their car on the show with the dented front end. 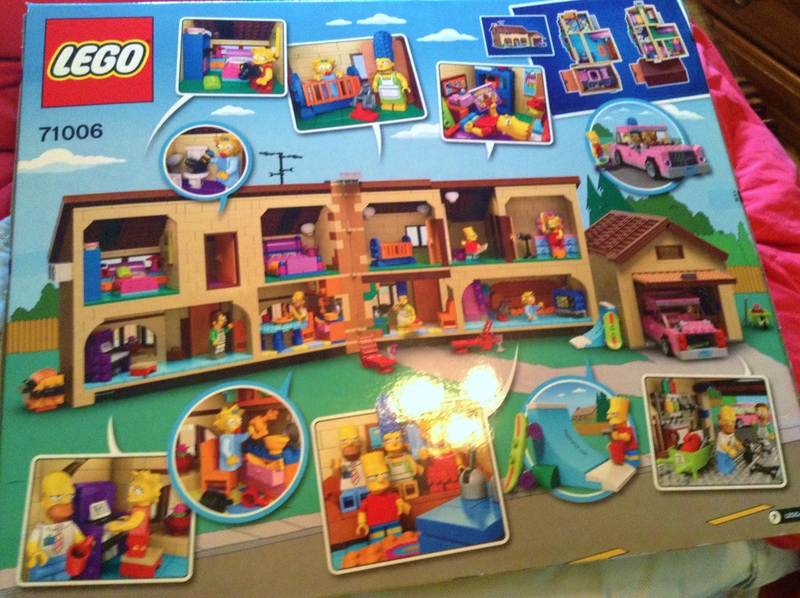 I wish they had somehow figured out a way to make the whole set slightly bigger so they could have included a few more details, such as Maggie’s car-seat in this case. It does have some fun features, though. There’s the moving gear shift, car stereo, and trunk that opens and closes. 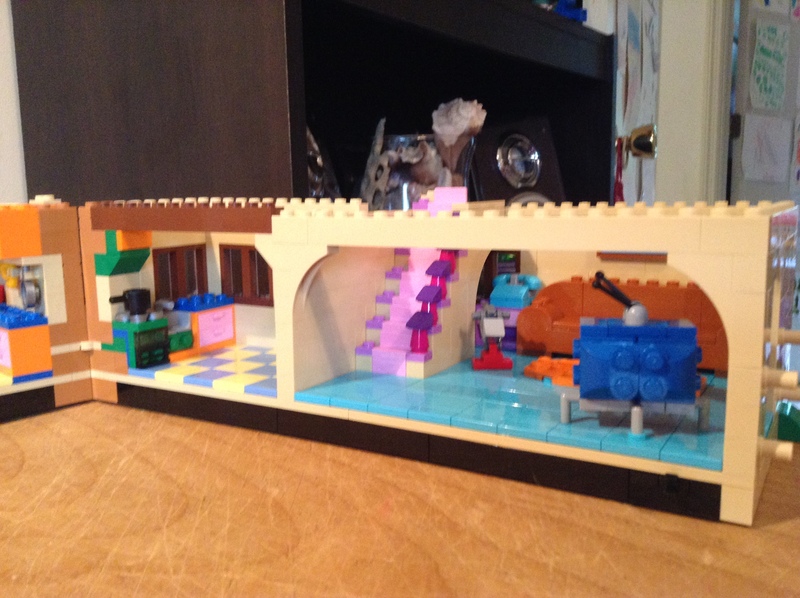 Next, we tackled the garage and it’s many intricate details. 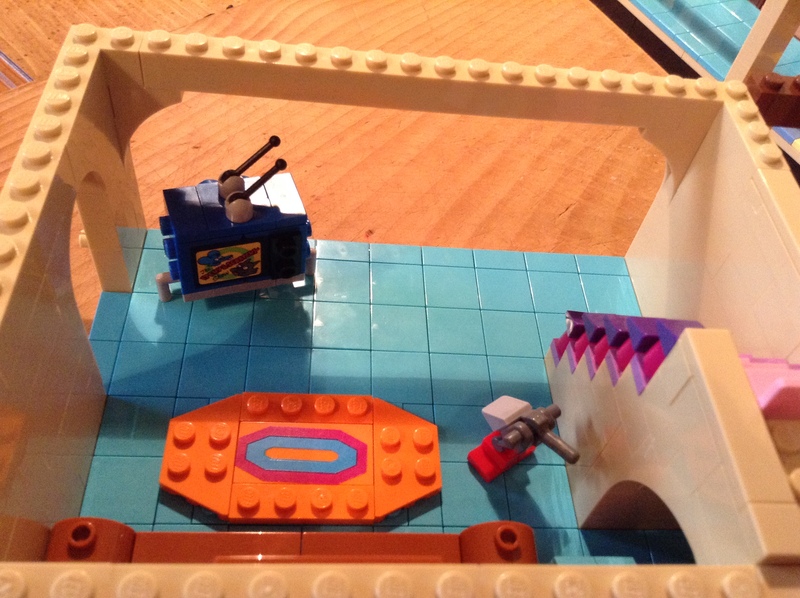 It wasn’t a technically hard piece to build-none of set is, really-but still was challenging enough to keep me engaged, and my son riveted! He worked on putting cupboard doors on, and window panes in their frames while I assembled the walls. 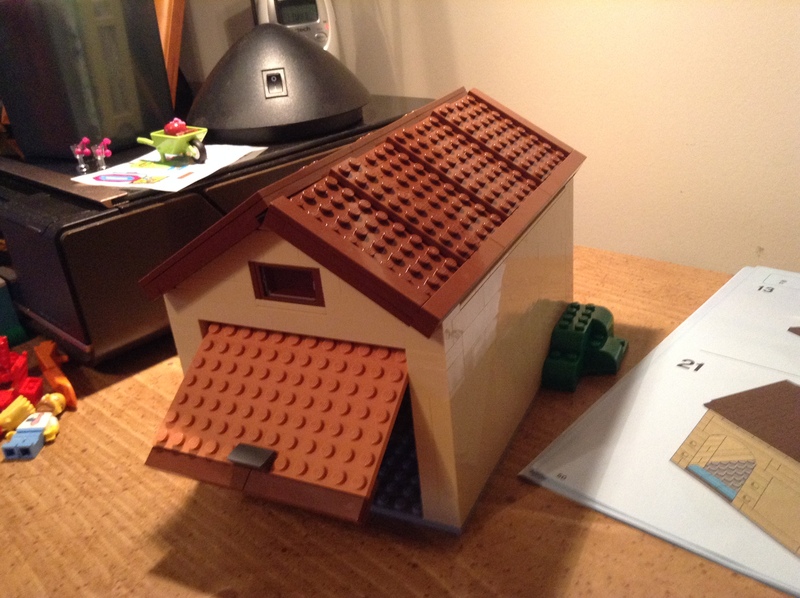 The door goes up and down, as one would expect it to do, and this pleased my son to no end, and backed that car in and out, in and out. In the garage there is a work bench with a cute little red toolbox on it that sadly does NOT open. There are about ten different tools in the garage including a paint sprayer, wrench, hammer, screwdriver, and power drill. These all fit into a container that is attached to a cupboard, with a shelf over it holding cans of paint. This doesn’t show a lot of the tools and the broom, shovel, and rake. 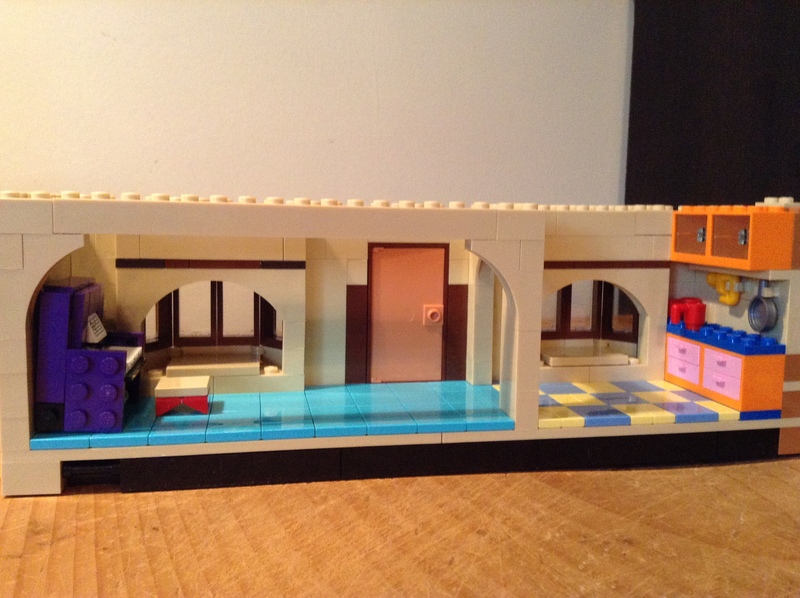 The cool thing about this set is that the house and attached garage have roofs for that finished, polished look, but they aren’t attached (just resting on the frame, but are kept from sliding off by pieces at the edge), so you can see and play inside easily. 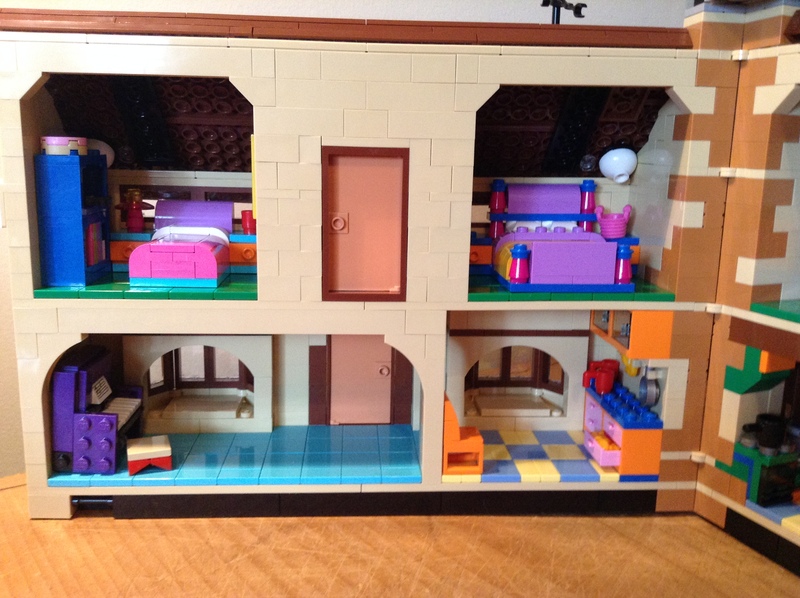 The house also opens up on hinges, and the top floor can be easily removed (it is attached to prevent slippage, but only by a few pieces). Without the roof on….there is a door leading from the garage into the house that you can’t see in this photo. 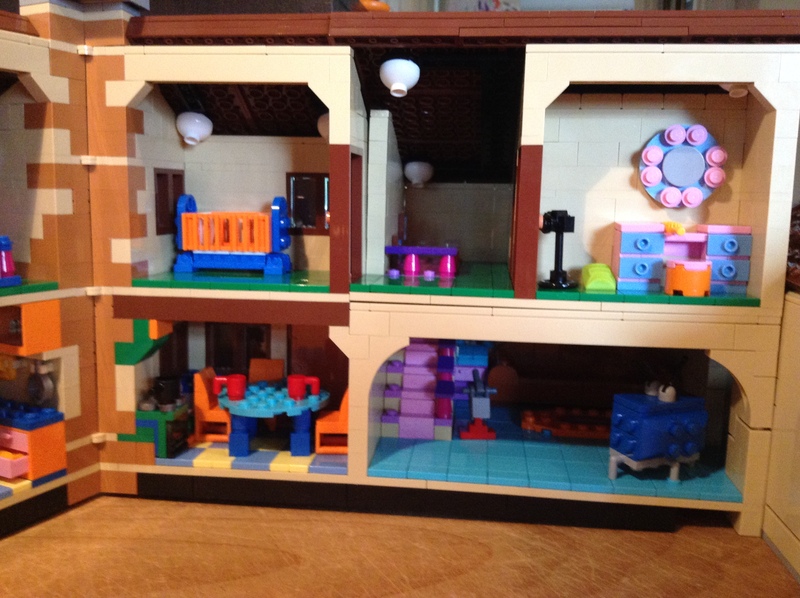 I loved building the furniture in the house and was constantly in awe of how they used so many pieces that I have seen time and time again and would have NEVER thought to use in that manner. 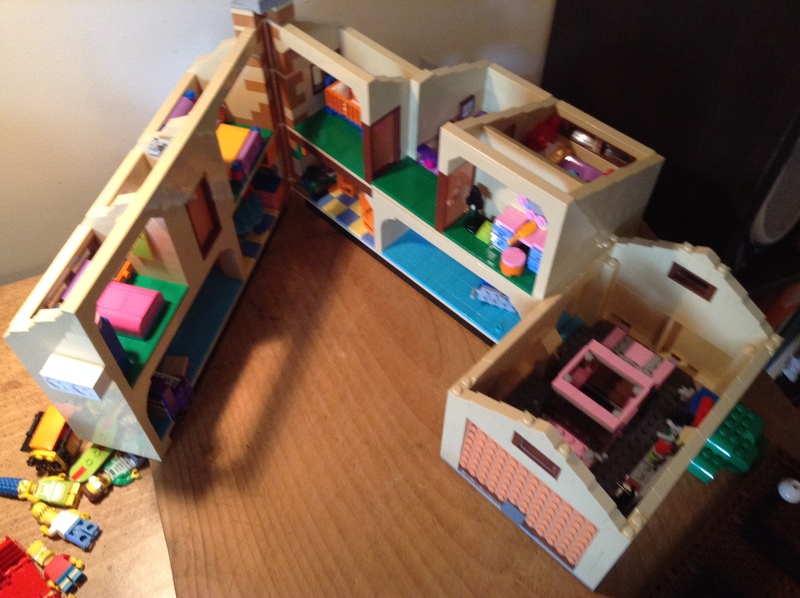 The rooms on the two floors are built in halves, because the house opens up on hinges. 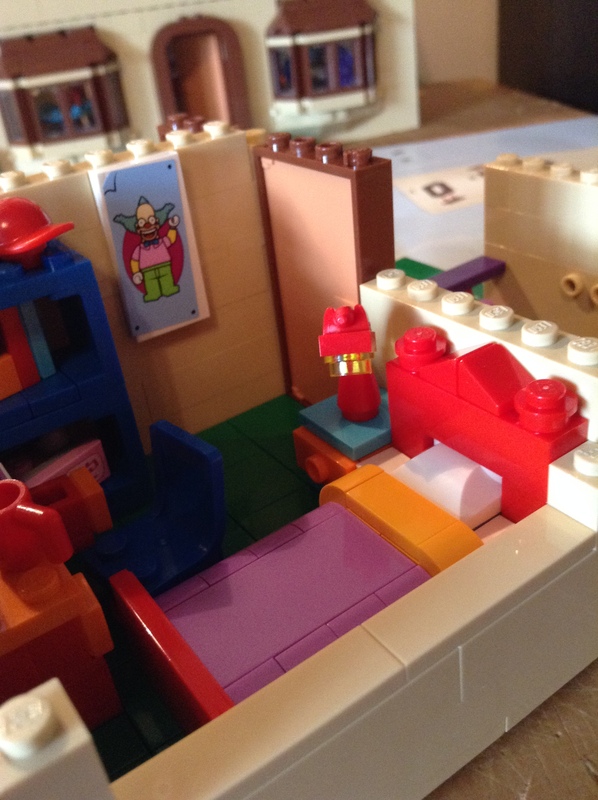 They look so of awkward while the house is open, but if you look down on the rooms when the house is closed, it appears normal and cozy. One half of the living room with the piano, and one bay window. The door in this room leads out to the front yard. 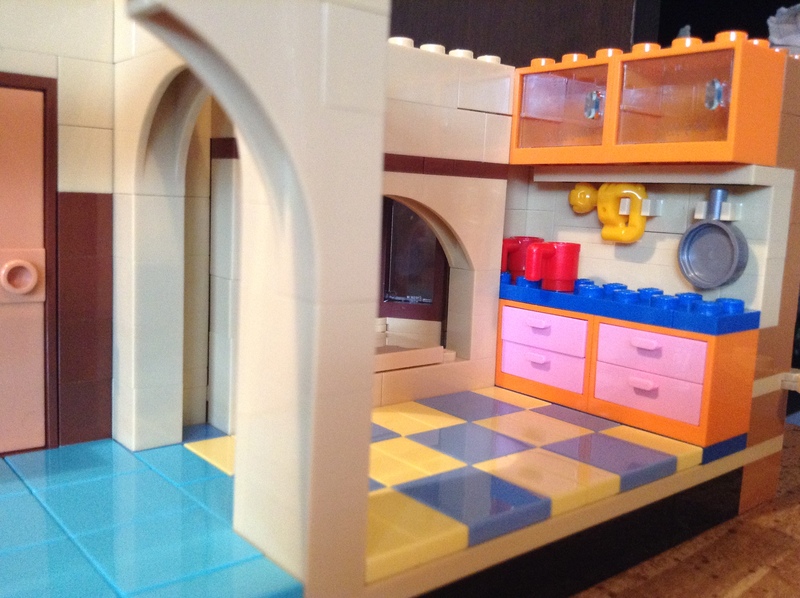 This is one half of the kitchen, which connects to the living room. You can see the other bay window and the front door. There are many kitchen accessories such as cutlery, bowls, plates, and pots and pans that are not shown here. The drawers and cabinets all open. The next section was the second half of the living room that holds the couch, iconic painting of the sailboat above the couch, the television, and the stairs that actually lead to the second floor. The T.V. is playing “Itchy and Scratchy”, of course. 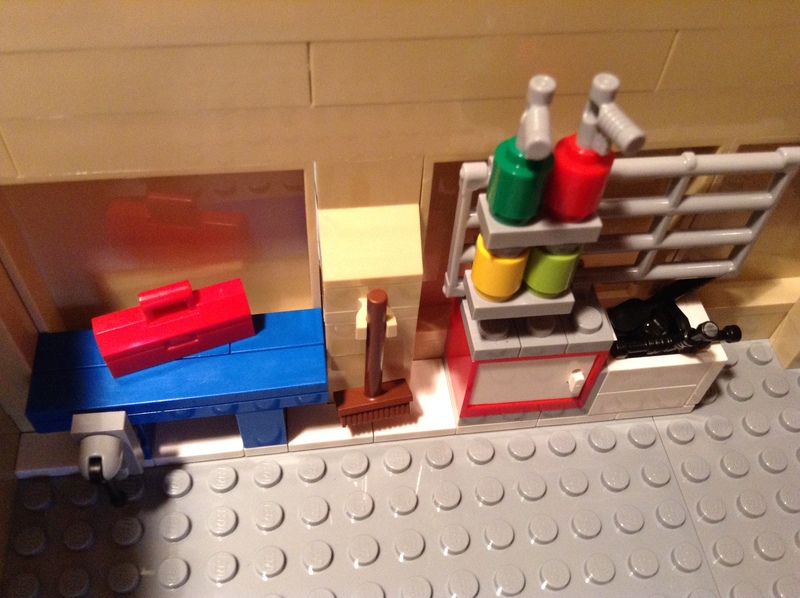 The item next to the staircase is a vacuum cleaner. 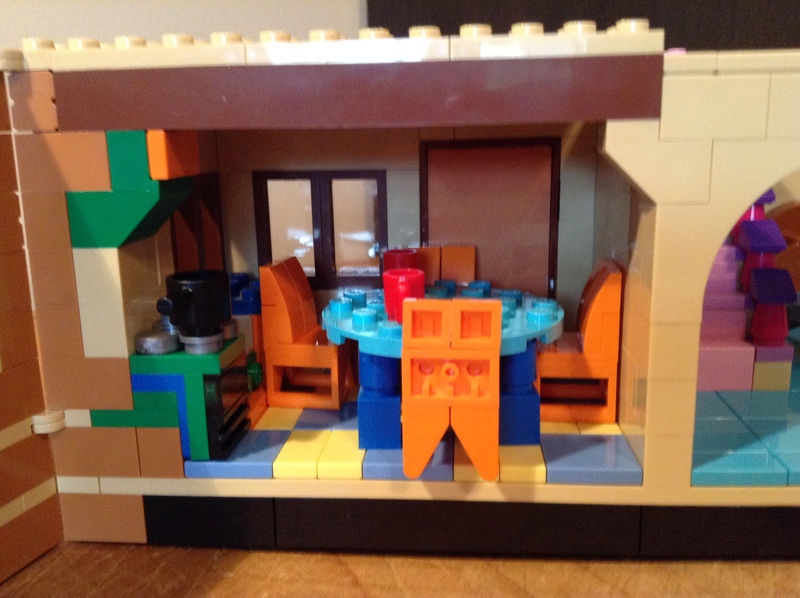 The second half of the kitchen with stove, sink, table and chairs, and the door that leads to the backyard. 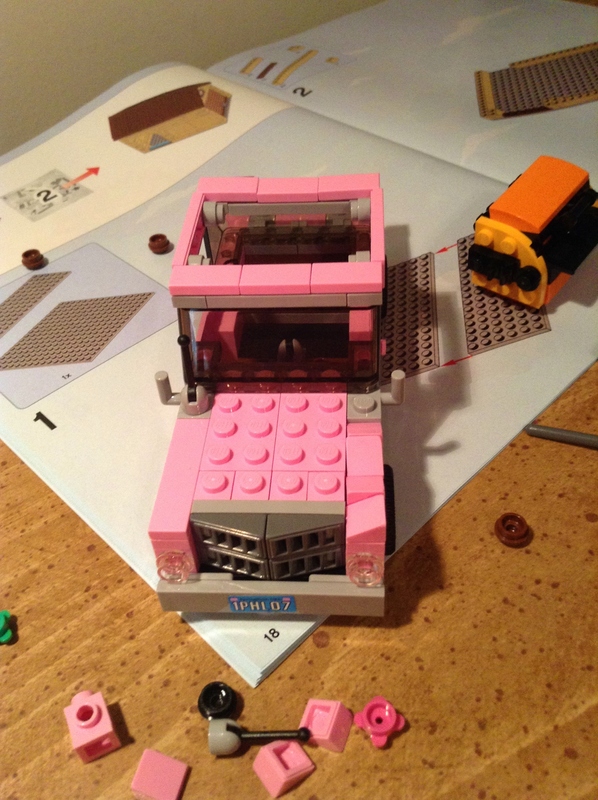 We set the bottom floor aside, and started to assemble the upstairs separately. Interestingly, they have you start from the center and work your way out. 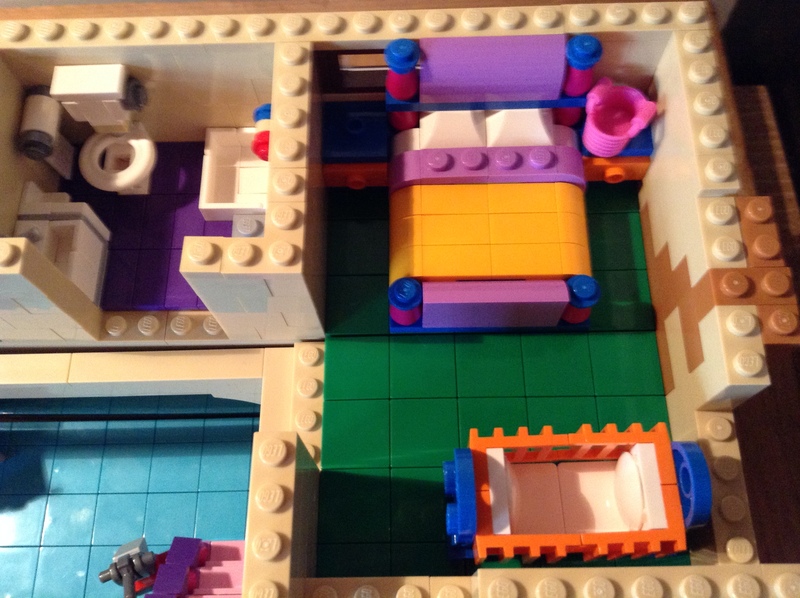 The first room was the bathroom, which was super fun! 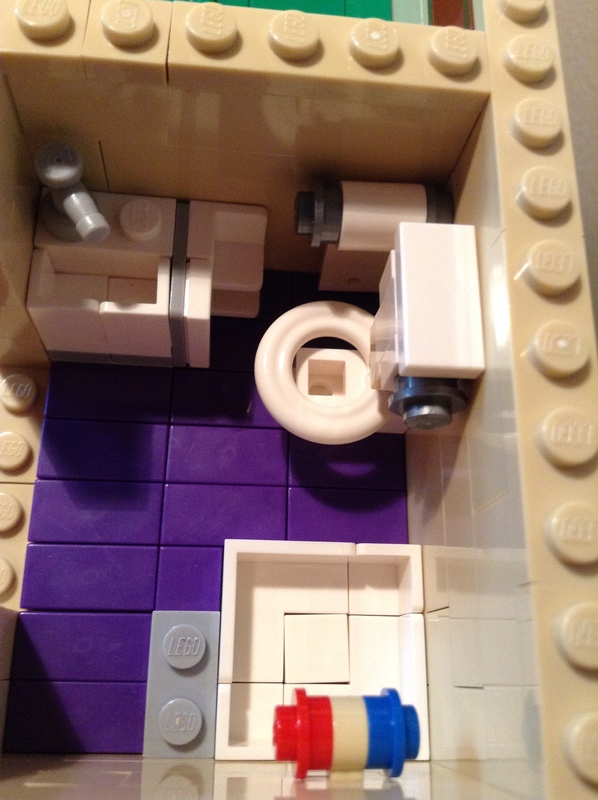 My five year old got a kick out of building the toilet. 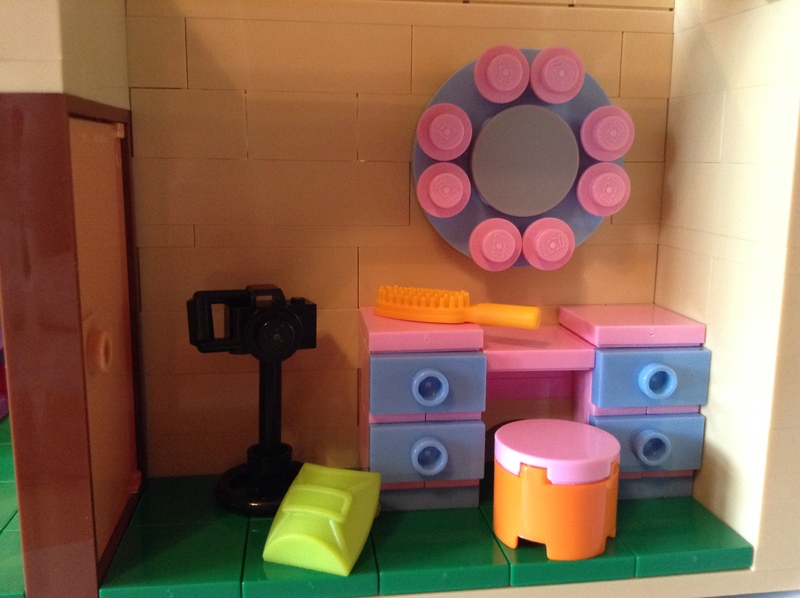 🙂 The bathroom includes said toilet, sink, toilet paper(again with the being amazed at the details: the paper is just one of the small car doors turned sideways. 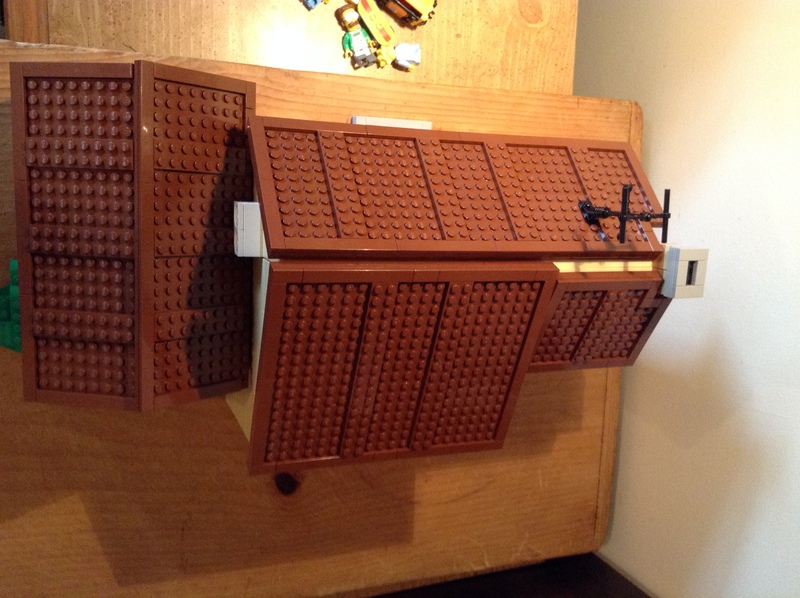 Those of you who are Lego builders from way back will know what I’m talking about! 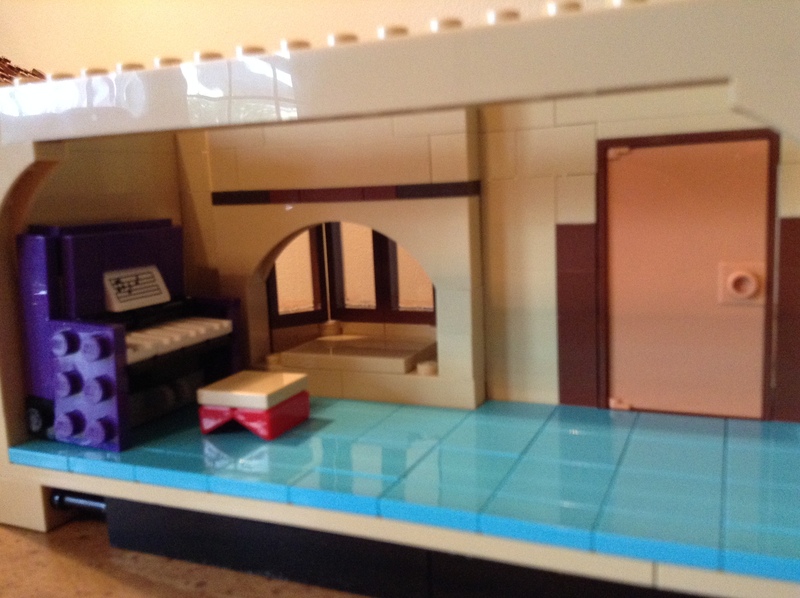 ), and shower stall. There is also a door that leads to the hallway. Completed bathroom without the house roof on. 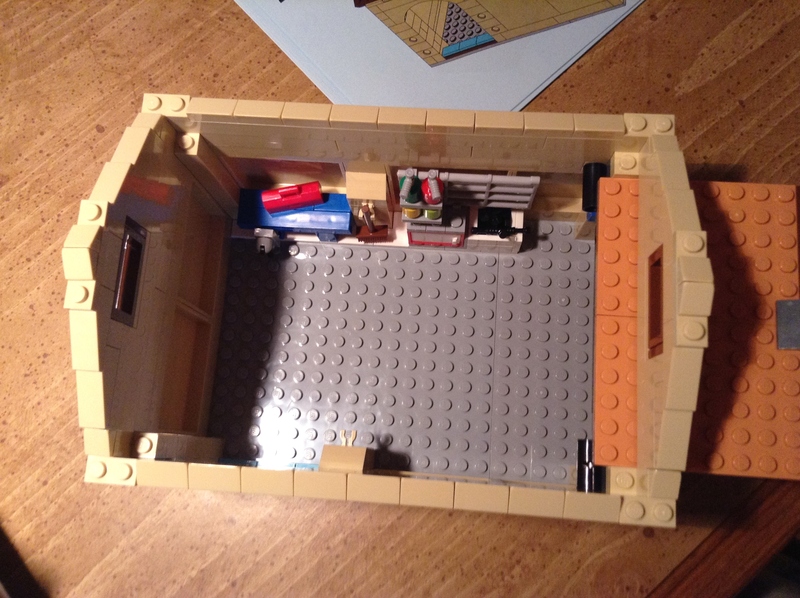 Next up was Marge and Homer’s room on one side of the bathroom. In the effort to save valuable space, Maggie’s crib is in their room, too. 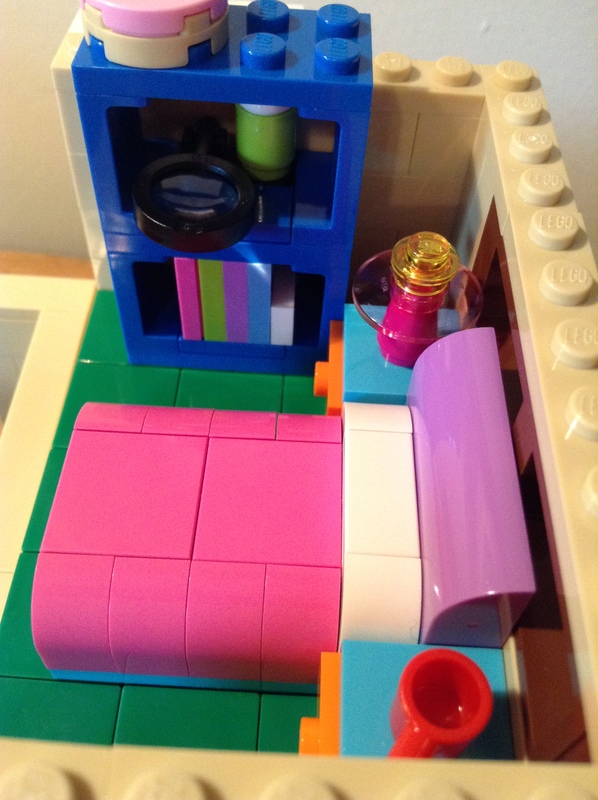 The pink item on Marge’s side of the bed is a basket of some sort. 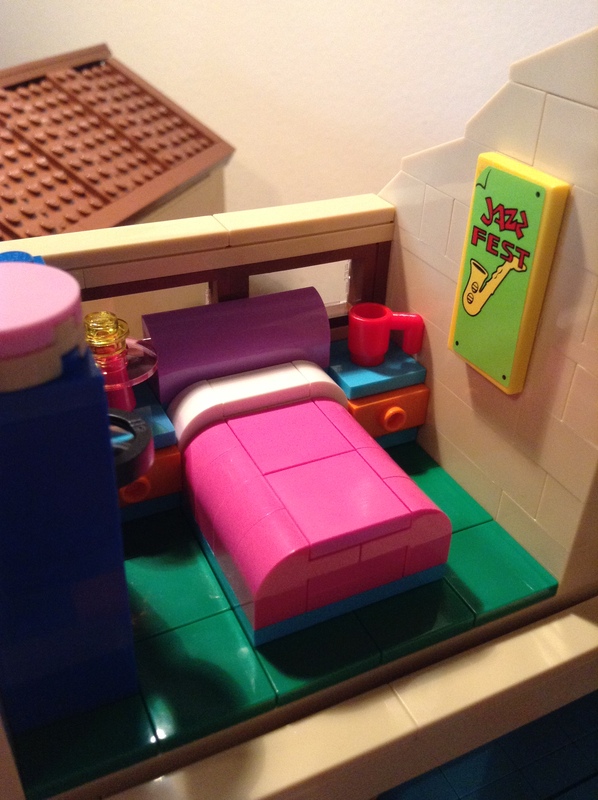 Lisa’s room is on the other side of the bathroom, and is divided in two, with her bed, bookshelf, and Jazz poster on one side, and camera and desk with mirror over it on the other side. 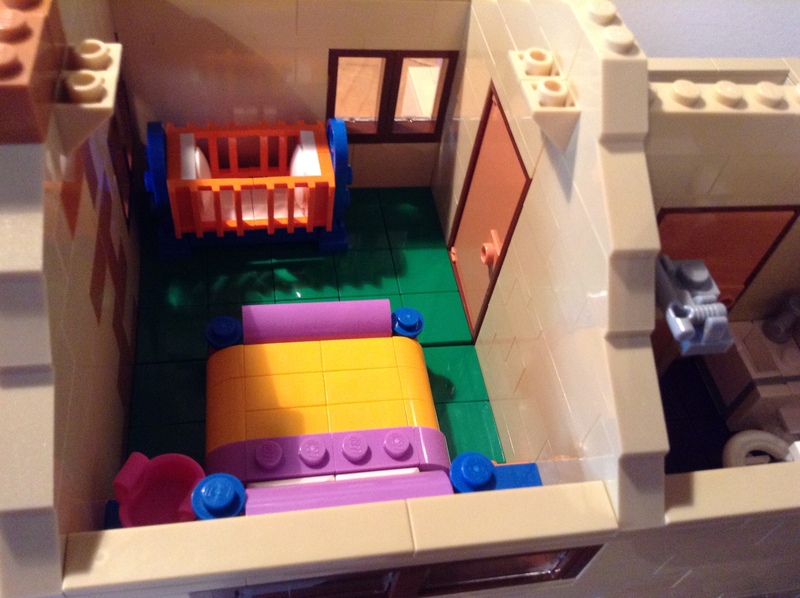 The last room in the house was Bart’s bedroom, which is the only room in the house, besides the small bathroom, which is not divided in two where the house opens. 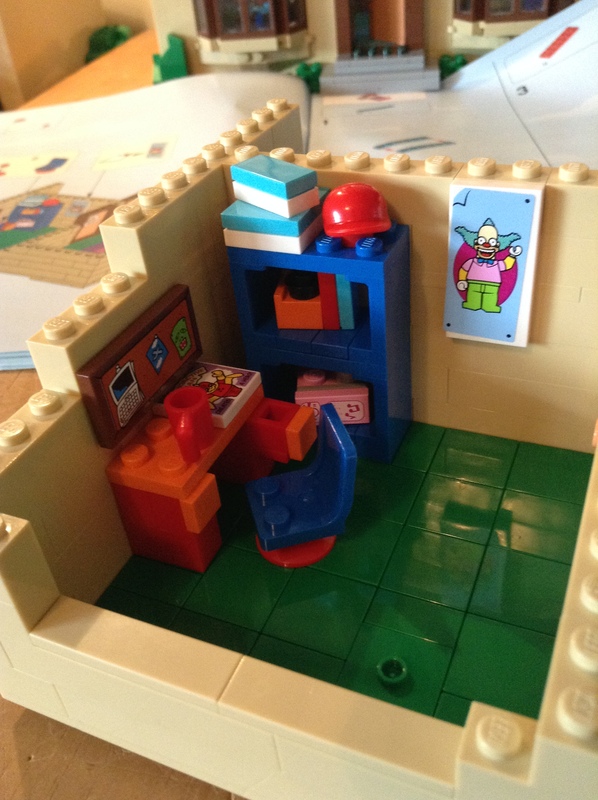 A whole lot is crammed into a little room, but it works! 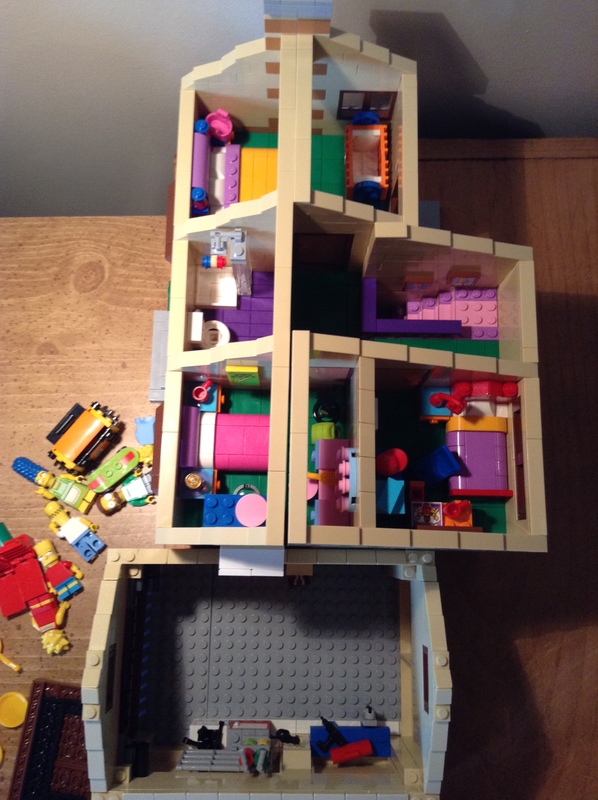 After completing the upstairs, the only things left to do were to build the roof, and attach the two floors and the garage. 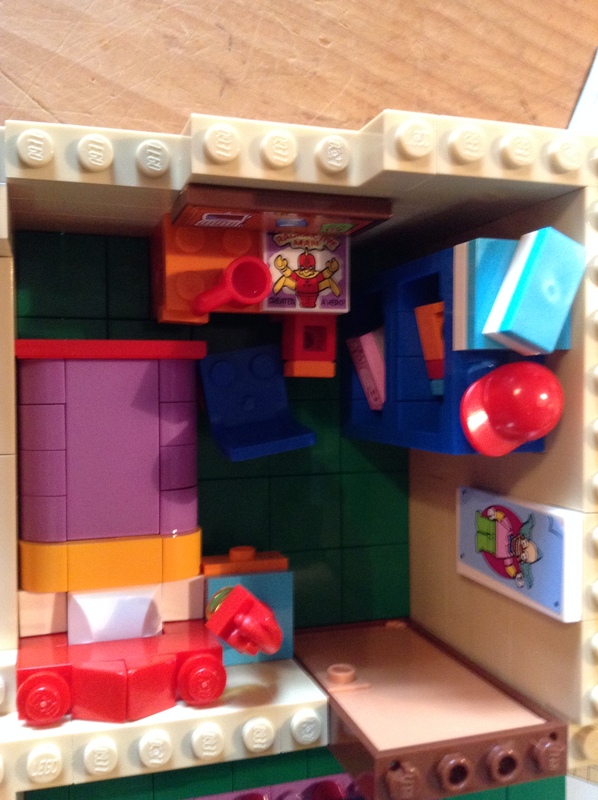 Aerial view of house with roof on…the little while box sticking out of the side right above the garage roof is an air conditioner, with “property of Ned Flanders” on the side, naturally.